Increases in the population of the goldfields and mining requirements made a solution to solving the shortage of suitable water imperative. The situation was exacerbated by the construction and operation of the steam-powered railways. The inevitable annual ‘water famine’ on the goldfields, during the hot, dry summer months, would bring the matter to the fore again through newspaper headlines and stories. The lack of water at Woolgangie in the summer of 1895 / 6 is a case in point. Early in December 1895, the fourth section of the Southern Cross – Coolgardie railway line was opened for general traffic and Woolgangie became head of the railway. Navvies, teamsters, forwarding agents, store-keepers and travellers camped, worked and conducted business in the canvas settlement that sprung up – all of them relying, like the thirsty steam trains, bullocks, horses and camels for water from a single tank or dam built to conserve runoff from Woolgangie Rock. Newspapers dubbed it the ‘Woolgangie Difficulty’ and CY O’Connor himself blamed greedy teamsters for taking too much water from the tank. I do not agree that private enterprise will ever do sufficient to prevent annual recurrence of water famine unless monopoly be granted sufficient to cover losses during winter months. I repeat here what I have before stated that these famines will occur yearly until either permanent water be brought on to the field, or Government provide and maintain large condensing plant, or municipalities do so, or private enterprise obtain monopolies to enable them to undertake such work. Battye Libray. 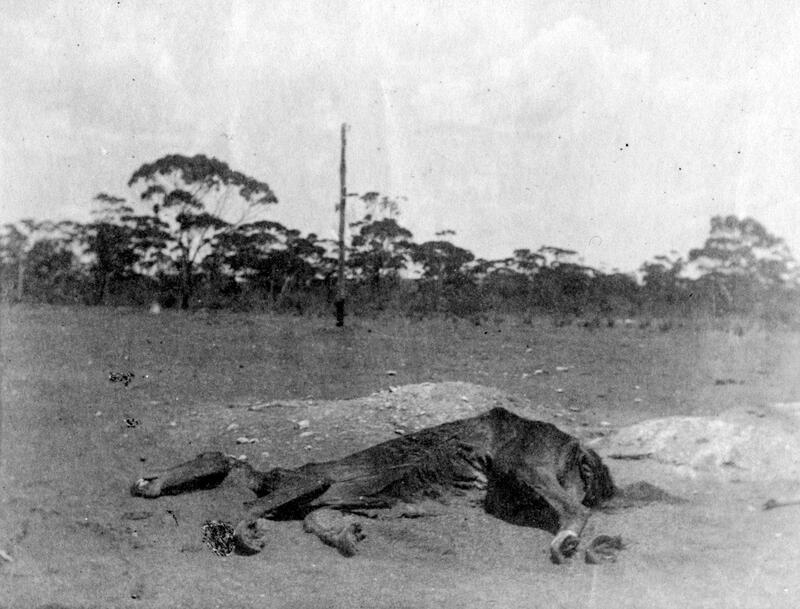 A horse dead from dehydration on the road to the Goldfields. During these times of water famine, caused by a combination of lack of rain and water sources coupled with high evaporation and demand, people on the goldfields and the railway settlements en route suffered considerably. Not only due to the heat, flies and dust, but also because the lack of water made conditions even more unsanitary. Rubbish, human excreta, animal manure and the bodies of horses dead of thirst accumulated. In these conditions diseases such as dysentery and typhoid spread rapidly and again Woolgangie is a nightmarish example. If the Fields were at the present moment, in dire extremities for a Water Supply for human consumption, as they have so recently been, there would hardly be found anyone objecting to the only scheme for giving permanent relief, whereas (the agony stage having been passed for the time being) there does not appear to be the same intense realisation of the situation as would … otherwise be the case. What has happened before must necessarily happen again, with probably even greater intensity, unless we get an absolutely certain water supply. As Whittington writes, CY O’Connor was correct. “In a few months another summer’s fears over water supplies returned to haunt the prospector and hinder mining development.” In this extract from a letter to his wife a mining engineer refers to two issues: converting saltwater from the mine to freshwater – an expensive process – and the non-delivery of equipment because the railway line is ‘blocked’ meaning trains bringing water have priority, this being the time of the Woolgangie Crisis.